Ensuring timely deliveries and extensive shipping options with ExpeditedShippers.com. Don't be caught without a backup plan for sending and receiving critical goods. When scheduled carriers can't deliver your orders on time, ExpeditedShippers.com steps up to get the job done. We have advanced tracking technology, swift vans and trucks, and a customer service staff committed to keeping you informed. With us on your team, you'll never have to worry about completing a complicated shipment. Flexibility and success are inseparable in the modern business world, yet many firms still limit themselves to planning scheduled orders. That may work under regular conditions, but when a carrier drops the ball, your firm still needs to complete the delivery on time. Your only option in this scenario is to find an expedited shipper who can pick up where the scheduled services left off. Expedited shippers specialize in getting orders to their final destination quickly without any advanced notice. To accomplish this, an expedited freight company will maintain vehicles in strategic spots throughout its operating area, leaving it free to begin an order as soon as it is needed. It then makes sure those vehicles are always ready to travel at maximum speed, and staffs them with drivers who know how to keep the orders safe. ExpeditedShippers.com takes each of these precautions and more, allowing us to complete our clients’ deliveries in time no matter the distance or circumstances. ExpeditedShippers.com takes care to never leave you or ourselves in the dark about the location of your order. From the moment our trucks hit the road until they have completed the delivery, we track them using the latest devices. Our customer service team is happy to relay that tracking information to you at any time, allowing you to set clear expectations for when your order will arrive. Besides letting us supply you with information, our tracking technology also speeds up the order itself. It allows us to examine the route our trucks are headed on, look out for possible sources of delay, and guide the vehicles around those obstacles before they ever reach them. This minimizes the amount of time your goods have to sit in traffic, as well as the fuel use and resulting cost of the delivery. Never take chances on a critical shipment. 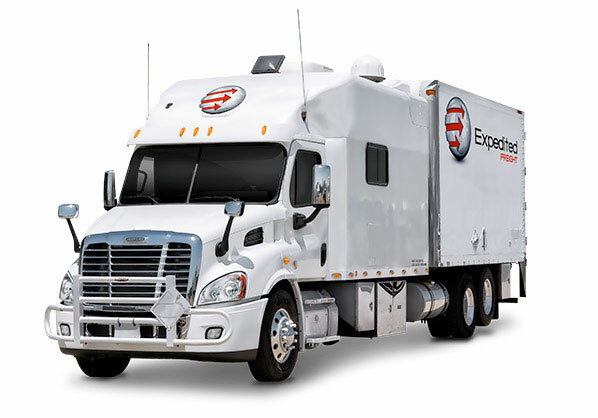 For more information on our expedited freight services or to obtain a free quote for your order, call (800) 713-1000 or visit ExpeditedShippers.com today.